Ideal conditions for the two races this evening with Force 3-4 Westerly breeze and glorious sunshine. Six boats on the water for two windward/leeward races with close competition throughout. The first (rather long distance) race took the boats upwind to the Western edge of Portsmouth harbour by the radar tower at Forton lake. After 20 mins of beating the relieved sailors settled in for a long downwind run to the stern of HMS Bristol and back to the finish line at RNSC. A second much shorter race then took place around marks close to RNSC and HMS Bristol. SLt Dom Jacobs (Fusion) took line honours and the first race. Cdr Andy Wood (Laser Radial) missed the first race but redeemed himself with a solid 1st place in the second (Sonnie Emeney being discounted as a non-RNSA member despite two impressive performances in the Pico). Pat Smythe and Lt Cdr Marie Whitehouse (Bosun) sailed well in the only 2 handed boat afloat. Hot on their heels were Cdre Ian Annett (Laser) and Lt Cdr Ian Watson (Fusion). Cdr Wood leads the series by one point ahead of Lt Cdr Watson but the competition is still wide open (see downloads). Up to 10 races will be sailed and up to 4 discards available so only the best 6 races count - with 3 more evenings planned anyone can still win. 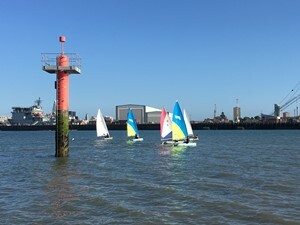 Two races are planned each evening on Thu 28 Jun, Thu 12 Jul and Thu 19 Jul so get down to the sailing centre for 1630 and get afloat. Book boats via Lt Matt Irwin on navyoptrg-mwswsntun3@mod.uk or simply turn up on the night.